For sure, you can get the car key replaced by a dealer, but that would cost you anything from $500 to $1000. Car dealers charge a lot to replace automotive keys, especially transponder keys and other types of advanced keys that belong to the new keyless entry system. Also, it takes days if not weeks for your dealer to get the authorization from the manufacturer to issue new car keys. So you will be without a car for a long time indeed. That’s why you are much better off hiring an automotive locksmith to cut the car key. A professional locksmith will cut a new key on the spot, at your location, and saves you time as well as money. You can save hundreds of dollars by hiring an automotive locksmith for key cutting. The locksmith performs key cutting and key programming for cars of all makes and models. They will have a sophisticated car key cutting machinery with them and specialized tools that only a locksmith can have. 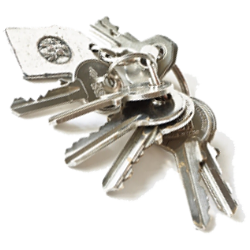 They carry a range of genuine car key blanks as well as aftermarket keys. Aftermarket keys look different from an average car key, but they can unlock any car and cost much less. Most modern cars have computers that need to be reset when the car key is lost. This can cost a lot. A professional locksmith will carry advanced diagnostic tools and car key cutting machines that reset the car’s computer even if you have lost your spare key as well, apart from the original. Your automotive locksmith will cut a duplicate spare key for you for a fraction of the cost charged by the dealership. If you have a transponder key, the locksmith replaces the transponder key chip and reprograms the transponder key so that the car can be started again without a hitch. Now, if the car key has been stolen, there is a risk of the criminal responsible for the theft waiting for an opportune time and coming back to steal the vehicle. So if the car key gets stolen, the car’s computer has to be reprogrammed and the vehicle’s body control module should be replaced. This is a complex task and it is something that only the most experienced automotive locksmith can handle. The locksmith uses diagnostic tools and other electronic equipment to recode the car’s body control and reprogram the computer. He also reconfigures the door locks and ignition barrel. You should hire a professional locksmith to replace keys that are wearing out, damaged, developing faults or misbehaving in general. You can have both standard and electronic car keys replaced by them at a competitive rate. Call us today at (956)261-5978. or inquire online and we will be sure to help you get back on the road. Everything You Wanted to Know About Automotive Key Cutting http://harlingenlocksmith.com/everything-wanted-know-automotive-key-cutting/ 3.8/5 based upon 20 reviews.